Soon after you get fixed braces, you will quickly realise that before leaving the house, you will need to take a small supply of essential dental products with you. Over time, this kit gets more refined until you take just the minimum you need to get by on a daily basis. For me, I started with a toothbrush, travel size toothpaste (available free as samples from most dentists), some interdental brushes, wax, spare elastics and a mirror. These items went everywhere with me as I felt the need to keep my teeth clean after every meal and snack. After a few weeks, I dropped the wax as I found I never needed to use any but pretty much everything else remained in my essentials kit until the day I had my braces removed. Even on occasions when I was just popping out, I had a medium sized interdental brush in my pocket as an emergency tooth / bracket brush and found this so useful on many occasions that it became my number one ‘must have’ item. 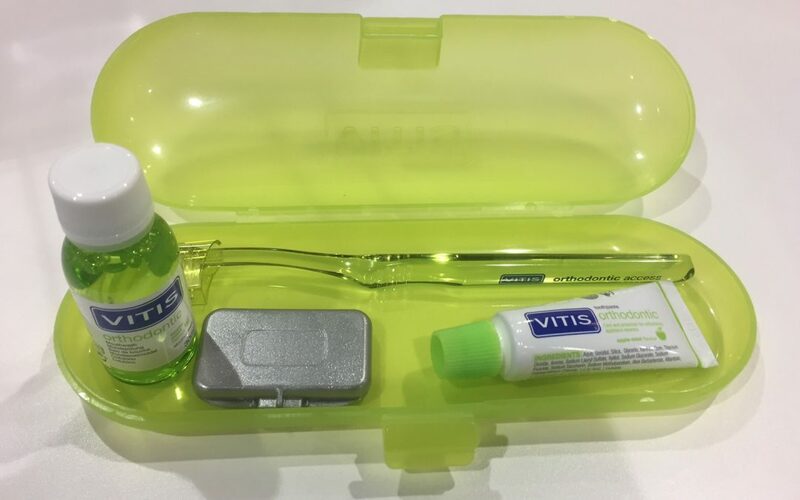 If you are lucky, your orthodontist will provide you with a starter essentials kit like the excellent one in the photo but if not, they are easy to put together and will be so useful to you whilst you have your braces.